SPORAH TV: WRAP IT. LOVE IT. WEAR IT..! WRAP IT. LOVE IT. WEAR IT..! FASHION: IT'S A WRAP! TURBAN HOTTIE COMING THROUGH..! Madeleine Laini told The Sporah Show, Wraps and turbans are beautiful accessories not to be understated and definitely worth the investment besides your everyday favorites. They can make you look ethnic, edgy or just funky-chic depending on your mood. They also possess a certain charm of old Hollywood glamour while maintaining touches of modern-day elegance. Turbans and head wraps come in a variety of textures, patterns, designs and fabrics so you are guaranteed to find something that pleases you. She told Sporah, "I have been wrapping my hair for the passed ten years. My greatest influence is probably the American soul singer and songwriter Erykah Badu; the “Queen of Neo-Soul”, who is the epitome of the urban Afro-chic culture. Badu set herself apart on the music scene not only through her electric sound, but also for courting the exaggerated head wraps which became her trademark". MADELEINE LAINI GETTING HER GIRLS READY TO TAKE THE STAGE.! Its like I can't wait to put it on. 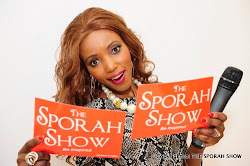 Sporah and the Models ..! Wrap it. Love it. Wear it. This is what Madeleine had to say..! The head wrap is a God-send method for covering up un-tamed, unwashed, uncombed, ‘could-not-be-bothered-to-do-my’ hair while still maintaining style and decorum. What I love most about head wraps is their versatility and sophistication. Over the years I have owned numerous styles of head wraps; from the countless African print designs relentlessly stolen from my mother, to the numerous silk ones I have bought and misplaced. Personally, I favour the African head wraps simply because of the way they make me feel: zealous, empowered, commanding and self-assured. Moreover, they keep me connected to my African roots. I am always complimented and often given nicknames by passer-byes when I wear it; most common names are Nubian Queen, Mama Africa or My African Queen (got to love the streets for a morale boost)". Its Amazing How Something So Simple To An African Lady Such As a Head Wrap Can Be Turned Into Fashion Haute Couture. GIRLS GIRLS..! READY FOR THE SHOW..! Sporah and The Girls On Set..! 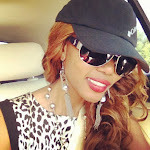 CELEBRITY ROCKING AFRICAN INSPIRED HEAD WRAP..! I couldnt be more proud than i already am right now to be african, im sure you have al seen stars like Beyonce', Solange, Chrissette Michelle, Rosemary Kokuhilwa and Jennifer Lopez trending in the lastest fashion trend ” the african head wrap”. ALL THIS AND MORE ARE ON NEXT WEEK.. NOT TO BE MISSED.. BE THERE..! ok THIS IS AMAZING! i wanna wear it even if men dont traditionally wear﻿ em! hi sporha! 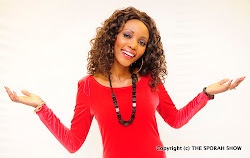 i am from Zambia .. i really idolize u because u portray good things in front of the show and i keep on learning with you.. mwaahh2x!!!!!! Ha ha ha, Cant wait for this one. inakuondoa uzuri wako wote na kukuzeesha juu. NO usifinge malemba hayo mdogo wangu.